ORANGE, CA--(Marketwired - Dec 14, 2016) - Twenty years ago, Orange County residents were buzzing with excitement as the site of the old Stadium Drive-In lit up with a new, state-of-the-art shopping and dining destination anchored by the iconic 25-screen Century Theaters multiplex. Fast forward two decades, and locals and visitors are buzzing with excitement once again as the venue celebrates its milestone anniversary this month with a "Cheers to 20 Years" contest. The campaign is Stadium Promenade's way of thanking Orange County for making it the region's premier dining and entertainment destination for 20 years. Fans can enter to win movie tickets, restaurant visits and other surprises via the Cheers to 20 Years contest through December 31, 2016 (must be 21 and older to enter). Visit www.stadiumpromenade.com, Instagram, Facebook or Twitter to enter and for more information. "It has been an honor serving the residents of Orange County and welcoming them to this iconic entertainment destination for the past 20 years," said Candice Martinez, vice president of property management, SyWest Development. "Since opening our groundbreaking multi-use entertainment center we've welcomed thousands of moviegoers and premiered countless movies at Stadium Promenade. Whether fans are catching a delicious dinner and the latest movie, or are on their way to or from a Ducks or Angels game, we look forward to continuing to serve the community as one of the area's most popular movie and dining destinations." Stadium Promenade is conveniently located near the Honda Center, Anaheim Regional Transportation Intermodal Center (ARTIC), City National Grove of Anaheim, Angels Stadium and the Anaheim Convention Center at the corner of West Katella and Main Street in Orange, just off the 57 Freeway. 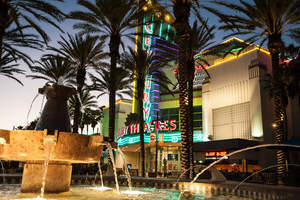 In addition to being the home of the Century Stadium 25 movie theater that features stadium seating and the latest releases in XD, dining destinations at Stadium Promenade include: Chili's, King's Fish House, Lazy Dog Restaurant and Bar, Prime Cut Café, Starbucks Café, Tilted Kilt, The Pint House Orange, Which Wich?, and Who Song & Larry's. Free valet parking is available on Friday and Saturday nights when you visit Stadium Promenade. Valet area is located near the theatre entrance. Stadium Promenade in Orange is a premier dining and entertainment destination with popular restaurants and the Century Stadium 25 movie theater. Managed by SyWest Development, a fully integrated commercial real estate firm, Stadium Promenade is located at the corner of West Katella and Main Streets in Orange, just off the 57 Freeway and near the Honda Center.